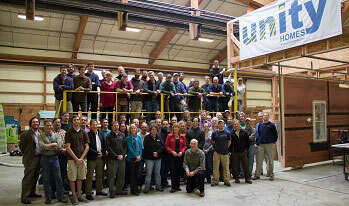 New Hampshire Governor Maggie Hassan (standing, center) visiting the Unity Homes production facility in October 2013. On October 9, 2012, Bensonwood launched Unity Homes with the goal of making ultra-efficient, off-site-built homes affordable for the average home buyer. To date, Unity Homes have been built along the East Coast as far south as Asheville, NC and as far north as Montpelier, VT, and have been praised as possibly the “greenest prefabs on the market” by TreeHugger’s Lloyd Alter. Designed to consume 50 to 75 percent less energy than standard newly-built homes, Unity Homes currently has four distinct 2 to 4 bedroom styles ranging in size from 1,028 to 2,450 sq ft. The home models are the Tradd (a classic tall cape), Xyla (an American bungalow), Värm (a Swedish contemporary) and Zūm (a passive solar optimized modern). All four of the highly-customizable styles have been built. 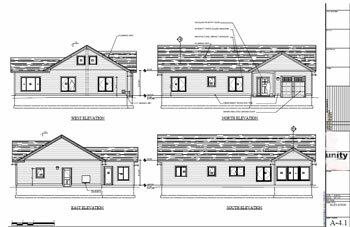 Three interpretations of the Värm design shown here illustrate the highly-customizable nature of Unity Homes. In the two years since its launch, Unity Homes has developed ways to raise the quality and performance of sustainably built homes while continuously trimming cost to make them ever more affordable. The company has already reached its original goal of trimming the typical build time to 30-35 working days for most projects and expects to get it down to around 20 working days in the future. Although Unity Homes first appeared in 2012, the seeds of the idea began much earlier. 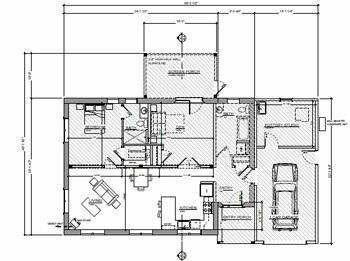 In 1991, Bensonwood began the long-term process of standardizing home production using computer-assisted design (CAD) software to optimize floor plans. “I have long believed that the average American home should have a much higher standard of build quality, durability and energy performance,” Tedd Benson said in a 2012 Green Building Advisor article about the Unity Homes launch. After years of building a reputation for higher-end timber frame projects, Benson and the Bensonwood team wanted to bring his building innovations to the market-rate factory-built world. There was also a philosophical element to Benson’s plan, describing the typical American home as a performance dinosaur, and too much of a long-term burden for homeowners and society. Then, as now, he wants to make that species extinct and transform the industry by offering an affordable home at a higher standard of efficiency. 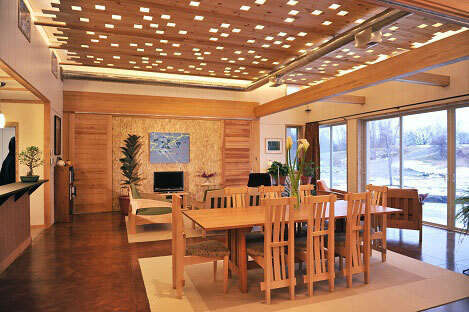 The LEED Platinum-certified, Net-Zero Energy president’s home at Unity College in Maine. 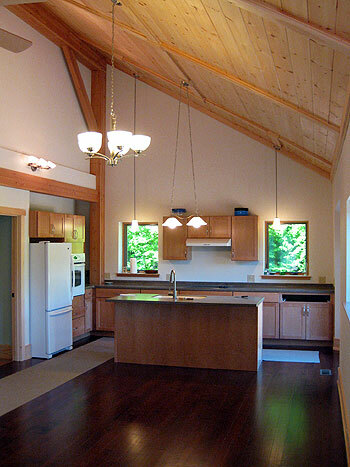 In 2008, Bensonwood received critical acclaim for its roles in fabricating the LEED Platinum-certified Unity House, a net-zero energy residence built on the campus of Unity College in Maine for the college president and his family. The project was important, not only because the building was designed to maximize energy performance, but because it highlighted the Passive House standard for airtightness—the most cost-effective and easily achievable aspect of the Passive House standard. 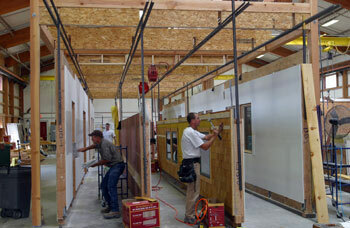 Inspired by the project’s success and what the company learned from it, four years later Bensonwood launched a separate company producing high-performance prefab houses. The company was dubbed Unity Homes because it was thought the perfect name to express the democratic, egalitarian nature of these homes designed for the average American family. Despite being in the throes of the worst housing crisis since the Great Depression, Benson realized that the company’s Bensonwood’s Open-Built® “operating system” capabilities and production capacity were being underutilized and warranted expansion. Tedd Benson also wanted to avoid reducing staff and a new division would allow the company to weather the housing downturn. Building system team members assembling wall sections for an early Unity Home. For nearly a year, the entire Bensonwood team worked together to design and engineer the Unity Homes offerings and develop all the information, renderings and floor plans. 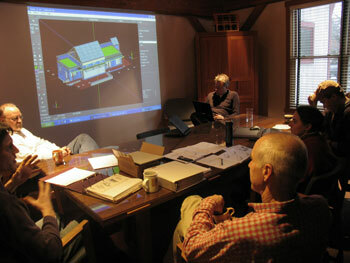 An early Net-Zero Unity House planning session. With no outside funding and many long hours, the company created a “40 year old start up,” Tedd Benson quipped at the time. In the end, Unity Homes was able to achieve both energy performance and price point goals with its high-precision panelized construction methods, keeping 60% of construction inside its production facility. Each home is organized into easily accessible “layers,” making for easier future upgrades and repairs. By the time Benson announced the new company’s launch in an October 9 post on his blog site, “The New House Rules,” Unity’s first two homes were already in production. In Montage Building, pre-designed, high-performance elements can be easily reordered to fit homeowner budget, lifestyle or location. The Unity Homes team sees these houses as more than another entry into the green prefab market, but rather as a complete rethinking of how houses are built. Many people in North America buy houses that might not last as long as they do; Unity houses, like the custom Bensonwood homes, are designed to last for generations. Additionally, instead of prefab or modular, Tedd Benson prefers the term “montage” to describe the homes, which essentially means “assemble” or bring together disparate elements to form an integrated whole. That use of montage refers not only to the building process where panels are assembled at the home site, but also to a unique approach to vernacular design. The homeowner would not incur the cost of hiring an architect, nor would they be choosing from a limited product line as with most modular or prefab houses, but be allowed a range of customization to fit their lifestyle, budget and location. Produced in Bensonwood’s Walpole, NH “studio,” the panelized wall, floor and roof assemblies are typically ready to ship to site in a few weeks. This work is concurrent with site prep and in parallel with other component fabrication such as the precision-cut beams and millwork. 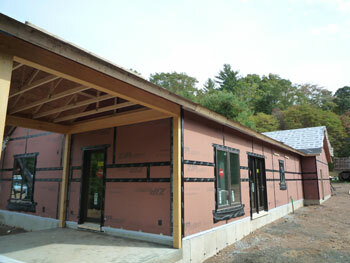 The onsite assembly of the weathertight shell is usually accomplished in one to three days, depending on complexity and garage options. From there, Unity Homes can be finished quickly because of the open layout and packaging of systems, such as pre-assembled HVAC modules. While a standard new home takes 150 days to build, Unity Homes can now shave the building cycle down to as little as 30-35 days. Tedd Benson has always stressed the importance of owner involvement in the homebuilding process, but J.C. and Nancy Woodward of Fitzwilliam, NH, took it to another level. J.C. and Nancy initially came to Bensonwood looking for a custom home, but after several discussions with associates, architect Chris Adams suggested they consider one of the new Unity Homes about to be launched. The Woodwards were intrigued and chose the Värm style—J.C. also chose to act as general contractor to cut cost. An early Värm in New Hampshire was finished by the owners to reduce cost. The site was prepped in late 2012, production began in February 2013, and by April the crew arrived with the home’s shell, which Woodward would finish out himself with help from some local subcontractors. Having built another house 25 years prior, he expected the typical chaotic construction scene with a host of endless problems to address. Because of the obvious attention to detail and quality, Woodward says, any problems that arose were small ones and easily solved. J.C. was there from 7 a.m. until evening every day and was stunned at how quickly and smoothly the home came together. He was also impressed by how, “every person on the Unity team deeply cared about my project’s success.” From architect Chris Adams “wringing function from every square inch” to make the house feel a lot bigger than its 1,700 SF footprint, to project manager Tony Poanessa repeatedly “going the extra mile” to make the project run smoothly, Woodward describes the experience as rewarding and fun. In fact, he was so inspired he is now taking a CAD drafting course at Keene State College and hopes to work as a project manager himself someday. 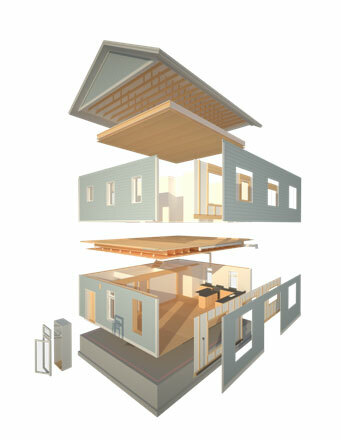 The airtight homes possess many of the standards of passive house: optional triple-pane windows, high levels of dense-pack cellulose insulation (R35 OBPlus Walls® and R44 roof), buttoned-up building shells with a Passive House level of airtightness to 0.6 ACH @ 50 Pascals or better, energy recovery ventilators, air-source heat pumps and more to reduce energy use by 50% to 75% compared to standard new houses. The homes’ operational efficiencies with low energy loads mean less power use and smaller HVAC systems. 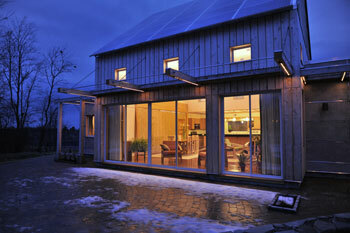 They’re also capable of achieving net-zero energy if the owner decides to add a modest solar electric system. Stressing health and comfort as much as energy efficiency, Unity Homes are well-lit, quiet, draft free and moisture controlled. In addition to the energy-saving features, standard specifications of the two- to four-bedroom homes include low-VOC paints and finishes, all-electric water heaters, Moen fixtures, EPA WaterSense toilets from Kohler, and high-quality woodworking and cabinetry. In addition, they’re comfortable, light-filled and spacious, have great air quality and are fitted with high-quality materials, finishes and fixtures. Another less-considered element is that they are quiet—something too often missing in our homes. Silence is a feature increasingly accepted as vital to health and emotional well-being; and with doors and windows closed there are no traffic sounds from the street, airplanes overhead, barking dogs or noisy neighbors. Tedd Benson often refers to these as providing vital “sanctuaries or “sacred spaces” for family. Heavily influenced by the thinking of John Habraken and Stewart Brand, Benson and associates developed the Open-Built platform to allow simple modification of structures as occupant needs change. The central idea behind Open-Built is to “disentangle” the building’s interior and exterior systems into separate, functional layers, which improves the efficiency of the construction process. That disentanglement also allows for long-term access, meaning homeowners and professionals can accomplish changes, upgrades and renovations with less demolition and rework. All systems within the Unity Homes will be continually scalable, with most mechanical and space upgrades able to be accomplished by the homeowners. The ultimate goal of all green prefab manufacturers is to get the quality control and efficiencies possible in a factory at an affordable price. A common complaint is that Unity Homes and its peers are not affordable when compared to conventional stick-built housing, despite the fact that these are not conventional houses. In truth, cost for this “beyond code” design and performance is competitive with current on-site, building-code-based construction when all factors are considered. These include: resale value, energy bills, maintenance and repairs, health effects and remodeling cost. Nevertheless, driving down cost is a top priority in the Unity Homes mission. Unity plans to broaden the market for their homes by continually reducing cost to match the cost of conventional building, which varies widely between geographical regions. The company has already achieved this in many areas of the Northeast. Tedd Benson is pretty clear about his future plans for Unity Homes: expanded production facilities across the country to lower shipping costs, continual improvement in the production process, and lower cost. Eventually, Unity Homes wants to merge its current panelization process with modules that would allow Unity to complete mechanical rooms, bathrooms and kitchens at its facility, and leave only 20% of the building process for on-site construction. Last, but not least, he wants Unity Homes to stand as a sustainable model for the industry, and with that to change how Americans view homebuilding from something to be dreaded and endured to something that is rewarding and even fun. In the end that will be a source of healing not only for future homeowners but for the planet. For those wondering if the green movement in homebuilding is on track to address personal and environmental needs, that train has already left the station. New-home buyers wanting to be part of the larger movement towards low-impact, healthy living while at the same time moving towards F3 (fossil-fuel-free) energy independence, have taken a hard look at Unity Homes’ family of high-performance, customizable homes—and decided to invest in the future. In the two years since launching in 2012, Net-Zero-ready Unity homes have sprouted up in three regions of the country (the northeast, southeast, and mid-Atlantic). Moreover, their owners, green home pioneers and early adopters of the new homebuilding technologies, have selected homes from all four of Unity’s design platforms—Tradd, Xyla, Värm and Zūm: an architecturally diverse collection of homes—customizing them to their personal lifestyle preferences. So, who’s buying these highly versatile, architecturally diverse homes, and what’s motivating them to invest in a low impact, high-performance lifestyle? To answer that question, let’s visit a few recent Unity homebuyers, all of whom coincidentally (or possibly not) are related to the health and wellness industry. As for green energy, Laurie plans to buy into a solar farm (Soveren Solar’s Vermont Community Solar program), to power her home’s high tech HVAC system, with Air Source Heat Pump and HRV (Heat Recovery Ventilation). And since the intentional community doesn’t permit wood burning, she plans to use a small, gas-fired Yodul stove to replace her old fireplace, for the warmth and ambiance it provides. Regarding the ability to customize her Xyla 212 plan, Laurie was able to extend the garage to add a special pottery-making room. “I wanted to build a pottery studio for my son while he’s away at college;” Laurie said, adding, tongue-in-cheek, “It may be the only way I’ll get to see him.” Her design also includes a custom connector between the house and garage that incorporates a bath, laundry and entry. 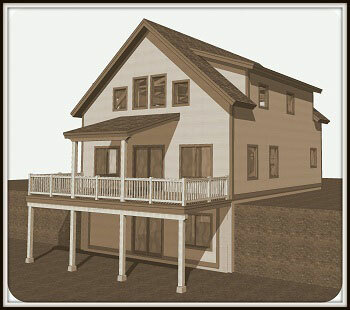 To further illustrate the flexibility of the Unity Homes platforms, when it was determined that the original site would have some site preparation challenges—leading to higher than anticipated costs—an alternate lot was selected and the original floor plan was modified to fit the new site without significant changes to the shell components. When Kimberly White, a homemaker and mother of two children, now aged 4 and 6, and her husband, Joshua, a medical doctor moved east from Minneapolis, Minnesota, they bought a plot of land in picturesque Barnard, Vermont and rented a basement apartment in a commercial building while researching high-performance home builders. 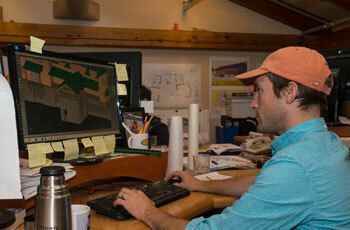 On how they found Unity Homes, Kimberly said: “My husband is an avid researcher. He began looking into quality builders in the area and Bensonwood and Unity kept coming up. So we visited their New Hampshire facilities, and then took a tour of a nearby Unity home. What really struck us besides the overall quality,” Kimberly said, “was the tightness and even temperature of the home. The homeowners said that they often had to crack a window when they used the fireplace. That really spoke volumes about the quality and tightness of the house,” Kimberly noted. The White’s bucolic wooded property, up a steep, winding road, has a couple of ponds and nice views, the perfect setting for their new Tradd 123, a 3,084 SF classic tall cape with 3 bedrooms, and 2.5 baths, plus a walkout basement that will be living space in the near future. The home will be rapidly raised and finished this fall, in time for the holidays. The home’s standard open living plan has exposed timbers and the first floor includes the living, dining and kitchen areas, a powder room and a laundry room. Upstairs are the master with bath, and two additional bedrooms with shared bath. An unfinished walkout level rounds out the space plan. Because Unity floor plans are highly customizable, the second floor was flipped so that the master bedroom could take advantage of the views. Lastly, for outdoor living enjoyment, the home has a 287 SF porch and deck. 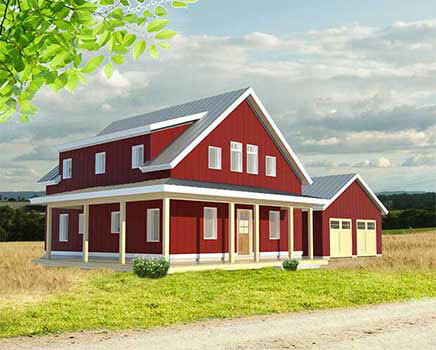 An elongated, freestanding, 581 SF 2-car garage will accommodate their tractor. Besides the reconfigured floor plan, the Whites opted for several upgrades, including an ERV (Energy Recovery Ventilator) air handling system to complement the standard air source heat pump. When Nikki and Joanna were contacted for the purpose of this interview, they were flush with excitement and anticipation after having just viewed their completed weather-tight Xyla 212 shell rise as if by magic, within a week’s time, in the coastal Connecticut town of Guilford. Nikki, a retired family doctor, and her partner, Joanna, a retired teacher and practicing artist, were drawn to Unity Homes for a variety of health, environmental, and aesthetic reasons, but seeing the home materialize so quickly was a real thrill. The couple wanted a large master bedroom, a yoga studio, and a home office/studio. To achieve this within the Xyla 212 platform, a master bump-out was added to the plan and interior partitions were reconfigured—all while retaining the core volume and window configuration. In addition to the master bump-out, they did specify a number of finish choices to make the home uniquely theirs, like a special Japanese Shoji screen pocket door, a screen porch and cedar siding on the exterior to better weather the shore climate. Heat pump technology has been around for over a century, and even though the technology has advanced, the principles are still the same. There are some who are still critical about Air Source Heat Pump (ASHP) technology, but we at Bensonwood and Unity Homes prefer to use them whenever possible as they’re especially well suited for highly- insulated, airtight homes with very low heating and cooling loads. In fact, our building envelopes are so energy efficient that our smaller, open floor plan homes can often be comfortably heated and cooled with one central unit. Regardless of home size, however, Air Source Heat Pumps are an extraordinarily efficient and feasible option for our homes, and this article will cover why we think this technology is the best all-around choice. Unlike combustion-based systems that produce heat at around 80-95% efficiency, ASHPs move heat from one location to another using the energy drive from the refrigeration cycle. This process is very similar to how a household refrigerator works. The increased energy drive allows a heat pump to produce 100 kWh of heating and cooling energy using only 20-40 kWh of electricity, resulting in efficiencies of 200-350%. How much electricity is consumed is dependent on the temperature differential between the outdoor and indoor air. In fact, a common reason people have shied away from using ASHPs in the past is because the efficiencies drop in cold temperatures, making these units not as ideal for cooler climates. However, recent advances in the inverter technology of these systems now allow ASHPs to operate down to -17°F, and produce heat at 100% of its capacity and efficiency down to 0°F. Heating with #2 fuel oil would cost around $1,600 a year at current rates. Heating with a propane-fired system would cost around $2,000 a year. It should be noted that all of the aforementioned options use combustion, which we know is bad for the environment. Electric resistance heat would cost around $2,500 per year and the impact that would have on the environment would be dependent on the source of electricity. Air Source Heat Pumps can generate the same amount of heat for only $1,090 per year, and they can provide efficient cooling in the summer! If the electricity used to operate an Air Source Heat Pump is generated by a renewable energy source, then the system has little to no impact on the environment. Oil, gas and wood-fired systems create heat using combustion. Combustion creates carbon dioxide, which is harmful to the environment and is a leading cause of unsafe emissions released into the atmosphere every day. 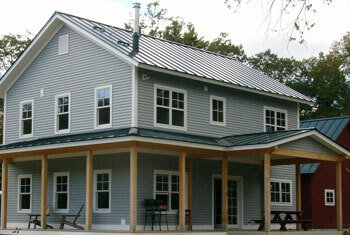 Using the same northern Vermont home as an example, the difference in electrical usage between electric resistance heat and the heat produced from an ASHP is around 9,500 kWh per year. A great way to look at those savings is how it will reduce the impact on the environment, as well as your wallet. This EPA website allows one to input estimated energy offsets and see how those savings will reduce the impact on the environment. A savings of 9,500 kWhrs is the equivalent to eliminating the CO2 Emissions from 737 gallons of consumed gasoline, or 7,037 pounds of coal burned or 15.5 barrels of oil consumed. And that is just one year. Imagine what the environmental savings would be over 30 years. 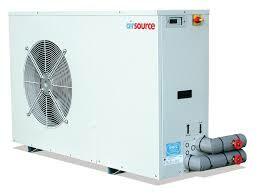 Air Source Heat Pumps can be ducted, centrally located or zoned with multiple head units. The system uses small copper refrigeration lines for connections, which minimizes required mechanical space and makes zoning much simpler. They offer a variety of head units that fit easily in both new and existing construction projects, and with their low operating loads these systems can be easily powered by a small renewable energy source. We’ve already discussed how Air Source Heat Pump systems can save money on annual utility bills, but for something so efficient one would think it has to cost more money than conventional systems, right? Wrong. These systems are very cost competitive with most other systems, and remember, they provide whole house cooling and heating, so they may even end up being less expensive. So what is the return on investment on a system that will not cost the consumer any additional money? It is immediate, but on average this system will pay for itself in energy savings in less than six years! The one downfall to these systems is that at around -17°F there is a chance these systems will shut down and stop producing heat, which is what scares some people away. What these people do not understand though is how infrequently the temperature drops below minus 17°F in most of the United States. Even in the coldest climates this is not a common occurrence, so not using a system that is as efficient as this one because of that one fact is not the right approach. A simple back up source of heat can be installed for use in these rare occurrences. 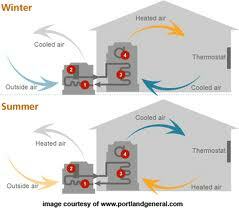 In our homes we use electric resistance for back up heat, because it is inexpensive and can also serve as zone heating. There are also systems available with electric resistance back up heaters that will continue to operate into these low temperatures. After heating and cooling, domestic hot water consumes the most household energy, but luckily they also make a heat pump for that. Heat pump water heaters operate at high efficiencies, and have settings to ensure a steady rate of hot water. When compared to electric resistance, oil and propane powered systems, these units will see a return on investment in less than three years. The only catch is that how efficiently they operate is dependent on the ambient air around the system, so installing a unit in a cold basement would not be ideal, but if you have a continuous source of heat to pull from, these units are a great and affordable solution. Geothermal or Ground and Water Source Heat Pumps (GSHPs) operate using the same heat pump technology as air source, except they move heat using the consistently warmer temperatures of the earth and ground water. Because of this they can operate at efficiencies of 300-600%. These systems are very popular in European countries with very strict guidelines for energy usage. GSHPs are growing more popular in the cold climates of the United States, but they have high upfront installation costs and a small pool of qualified installers. Like most emerging and efficient technologies, it may take some time before these systems are offered at prices that offer an attractive return on investment. Buildings are responsible for around 40% of the carbon emissions released into the atmosphere every day, and with the fluctuating cost and availability of fossil fuels, and threat of irreversible climate change, another solution is very necessary. With the advancements in heat pump technology and decreasing costs of renewable solar energy, achieving net zero energy consumption is not just feasible, but a great investment as well.